We announce with pleasure that Leonard L. Riskin has joined the Integrative Law Institute Advisory Board. Riskin, who is the Chesterfield Smith Professor of Law at the University of Florida Levin College of Law and Visiting Professor at Northwestern University School of Law, brings perspective to the Advisory Board as a distinguished pioneer in teaching conflict resolution, mediation, and interest-based negotiations. Leonard Riskin was among the first scholars to focus on the importance of self-reflective awareness practices for lawyers. He began teaching meditation practice for lawyers in the early 1980’s, and continues to be a leader in the growing movement to bring mindfulness practice into law school education. At the University of Florida, Riskin directs the Initiative on Mindfulness in Law and Dispute Resolution, and is a Senior Fellow in the Center for the Study of Dispute Resolution. Early in his career as an academician, Riskin observed a “huge amount of suffering among law students, lawyers and clients,” and recognized mediation “as a way to reduce unnecessary adversarialism and suffering.” Throughout his career, he has worked to bring this perspective into mainstream law school curricula. Riskin has won recognition from the CPR Institute for Dispute Resolution for his curricular innovation and from the American Bar Association’s Section of Dispute Resolution, which conferred on Riskin its award for Outstanding Scholarly Work. His research and writing have addressed a wide range of topics, from decision-making in mediation, to the impact of mindfulness meditation on law students, lawyers and clients, to the role of emotions in negotiation. Riskin authored the law school textbook Dispute Resolution and Lawyers. He has taught courses on “Conflict Management in Legal Practice” and “Advanced Dispute Resolution,” and continuing education programs for practicing lawyers on mindfulness meditation as a means for lawyers to manage stress, handle conflict more effectively, and get more satisfaction out of their work. Riskin is one of the first legal scholars to appreciate that lawyers and negotiators resolve conflicts not only with legal training and experience, but with the “quality of their presence.” He teaches that the fruits of mindful awareness practices are “contagious and [affect] other people’s consciousness and state of mind.” Riskin’s groundbreaking work to bring humanism into law practice enriches ILI’s focus on body-mind awareness practices as one of the core vectors of integrative law. Why Seek Out Certified Integrative Lawyers? The Integrative Law movement is gaining traction and is reaching out to lawyers who may not yet see the need for changing business as usual. ILI’s workshops and programs for certifying integrative lawyers are unusual in that they aim to reach lawyers who don’t self-identify as peacemakers–lawyers who without ever meaning to may be adding to the suffering of their clients who have legal issues that arise from broken personal relationships. In this interview from KWMR radio, ILI Director Pauline Tesler talks about ILI’s mission: to reclaim law as a healing profession. She explains why it can be so important to take your personal legal issues to a lawyer who has taken the time to learn about emerging discoveries in the biological and social sciences concerning how humans make decisions, and how we experience and resolve conflict. In other words…to an integrative lawyer. Lawyers in the U.S. are working on creative models for bringing transactional lawyers into the Integrative Law movement. They ask: what if contract negotiations began with a discussion of the parties’ shared vision, mission, and values? And what if those principles were tied in the contract itself to specific ways of addressing conflicts that expressed those principles? Linda Alvarez, a California lawyer, sees the contract as a private, self-determined justice system within the public justice system. She invites lawyers to see our job as helping our clients create values-driven deals that include a framework for normalizing and addressing constructively the disagreements and disputes that may arise downstream. This is Integrative Law for transactional lawyers and in-house counsel, and it provides an important “preventive law” dimension to our work as humanistic conflict resolution professionals. Every contractual relationship is, in essence, a self-contained legal system. The terms of the contract are the laws that the parties write for themselves and the dispute resolution provisions in their contract – whether written or unwritten – determine the justice system and process that will be used when the parties need to manage change or resolve disputes between themselves. Their contract is a private system within a public system. Our larger, so-called legal-justice system encompasses and impacts the workability of the private contractual system; but this larger context does not mean that the parties to a contract are powerless – unless they choose to be so. It is, in fact, quite possible for the parties to retain a good deal of their power of self-determination and self-governance by conscious, enlightened design. 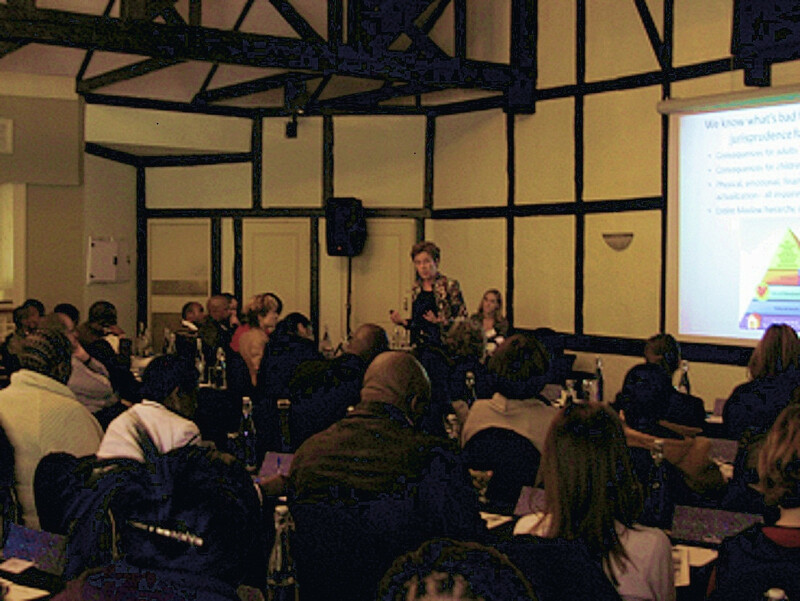 Participants in the workshops came from a broad swath of the legal profession, including a large contingent from South Africa’s government-funded Legal Aid Society as well as lawyers from Africa’s largest international commercial law firm, Edward Nathan Sonnenbergs. Sharon has created a remarkable communications system called “Powerful Non-Defensive Communication.” PNDC teaches how to recognize and alter the aggressive and defensive content embedded in what we say and how we say it. Sharon’s method teaches refined techniques for asking genuinely curious questions that cause listeners to think and that often make them want to answer, for themselves as well as for the questioner. Lawyers have been flocking to Sharon’s training programs and workshops like bees to flowers, because her work provides essential core skills that we lawyers need if we are to facilitate constructive, client-centered, interest-based, out-of-court dispute and conflict resolution. Whether we are lawyer-mediators or collaborative lawyers, we are grounded in professional legal training that treats questions as just another weapon we use in service of winning. Sharon’s trainings open lawyers’ eyes, helping us see the extent to which we –often unintentionally–ramp up conflict by the way that we speak. She teaches concrete methods for peeling away the aggressive and defensive content of our questions so that they become tools for discovery of new information. I can’t recommend her courses and workshops highly enough for lawyers who are serious about making the shift away from adversarial methods and toward constructive facilitation of deep resolution. Webinar Description: Learn and practice more than a dozen formats for asking questions that can enhance our power to disarm defensiveness and get to the heart of an issue quickly, opening up the kind of genuine conversation that can lead to deeper resolution and connection. More Complete Information . . .
Workshop Price: $385.00 (Partial Scholarships Available) – Register Now! Special 2 person offer Workshop Price: $670.00 – Register Now! To make payment arrangements other than by credit card, contact Sharon directly. Place: Embassy Suites Hotel, Dallas Market CenterConference Overview: The focus is to build leadership skills that increase economic strength and collaboration among women across professional boundaries. Unlike most other conferences, this one is structured so that each speaker will present to and/or work with the whole audience. The cost is also very reasonable. Sharon Strand Ellison will be one of the five speakers and and she says, “I’m extremely impressed with the kind of power, creativity, and integrity the other four speakers possess ~ and excited to learn from them. I hope you’ll consider attending this exceptional conference on women’s leadership and share the information in your own community of colleagues and friends.” For a More Complete description of the conference and speaker bios, click here ..
to provide a means for members of the public to locate and identify lawyers who are committed to providing professional services that address human conflicts constructively, not solely as legal problems but also across the many other dimensions in which conflict impacts lives. The core of the certification program is ILI’s own workshops and programs for practicing lawyers. The hallmark of ILI programs is that they integrate creative conflict resolution tools, traditional understandings and practices, and emerging research discoveries from the biological and social sciences in a manner that lawyers, mediators, and judicial officers can use right away in their work. ILI’s workshops and trainings include hands-on experiential components wherever possible. Applicants for ILI certification will be asked to provide documentation of at least 40 hours of continuing education course work consisting of at least 25 hours of workshops and trainings provided by ILI, with the balance consisting of approved courses provided either by ILI or by its partner organizations and colleagues. Lawyers who have earned ILI’s certification in integrative law will be listed on ILI’s website and social media sites with links back to their own websites, and will be permitted to display ILI’s certification badge on websites, social media sites, and on professional materials. Under development is a plan to provide Certified Integrative Lawyers with an online participatory virtual community. The certification program, some components of which are still under development, is being launched in phases beginning in early 2013, so that participants in current ILI workshops who have interest in certification can be aware of this option as they plan their ongoing continuing education. For 2013, continuing education credits as follows may be submitted for purposes of certification. New ILI courses and a limited number of select additional continuing education partners will be added to this list from time to time. The courses will be offered in major U.S. cities during 2013 and 2014. By 2014, ILI also expects to offer some courses online. Invitations to bring any ILI program to your city are welcome, as are program co-sponsorships. Lawyers may submit for certification purposes proof of in-person attendance at approved continuing education courses offered by these organizations and individuals. Ordinarily, courses submitted for certification must carry either state bar approved continuing legal education credit, or alternatively, APA, state, or similar approved CEU credit intended for other professions, such as psychologists, psychotherapists, or health care professionals. Courses offered by ILI partners that do not carry such approved credit or that are attended online will be considered on a case-by-case basis. ILI welcomes certification partnership inquiries from workshop leaders, trainers, and organizations that provide high quality continuing education in the vectors recognized by ILI for integrative law certification. We consider for certification partnership programs that offer substantial original material developed by the presenter. I’m pleased to pass on to the Integrative Law community this announcement from Advisory Board member Dacher Keltner’s Greater Good Science Center, one of ILI’s partner organizations. Mindfulness and other self-awareness practices are part of the core skills that integrative lawyers can bring to our work with clients experiencing conflict. Learning the skills taught in this workshop can make you more present, energetic, attentive, and compassionate when working on high-stress cases, to your own personal benefit as well as to the benefit of your clients. This day-long conference, featuring a keynote by Jon Kabat-Zinn, will illuminate the connections between mindfulness and compassion, focusing on how mindfulness can deepen relationships and build compassion, including self-compassion. Speakers will discuss how to apply scientific findings to the real world, drawing on cutting-edge research and inspiring success stories. Attendees will practice research-tested mindfulness and compassion techniques and learn from program leaders who have fostered mindfulness and compassion in schools, health care, and beyond. Other presenters will include Kristin Neff, PhD, author of Self-Compassion; Paul Gilbert, PhD, founder of Compassion Focused Therapy; Shauna Shapiro, PhD, expert on integrating mindfulness into Western psychology, medicine, and education; and Dacher Keltner, PhD, faculty director of the Greater Good Science Center. Event will be webcast live! We are delighted to announce that Dacher Keltner, Ph.D., has joined the Advisory Board of the Integrative Law Institute. A leading researcher and scholar in the relatively new field of positive psychology, Dacher is the executive editor of Greater Good, the founding faculty director of the Greater Good Science Center, and a professor of psychology at the University of California, Berkeley. He is also the author of Born to Be Good: The Science of a Meaningful Life and a co-editor of The Compassionate Instinct: The Science of Human Goodness. His prolific research and writing have helped to transform our understanding of what it means to be human by investigating positive attributes such as compassion, empathy, cooperation, and altruism as the evolutionary endowment that enabled our survival and flourishing as a species, and that make us–well–human. Positive Psychology is the scientific study of the strengths and virtues that enable individuals and communities to thrive. . . . This field is founded on the belief that people want to lead meaningful and fulfilling lives, to cultivate what is best within themselves, and to enhance their experiences of love, work, and play. Positive Psychology has three central concerns: positive emotions, positive individual traits, and positive institutions. Understanding positive emotions entails the study of contentment with the past, happiness in the present, and hope for the future. Understanding positive individual traits consists of the study of the strengths and virtues, such as the capacity for love and work, courage, compassion, resilience, creativity, curiosity, integrity, self-knowledge, moderation, self-control, and wisdom. Understanding positive institutions entails the study of the strengths that foster better communities, such as justice, responsibility, civility, parenting, nurturance, work ethic, leadership, teamwork, purpose, and tolerance. My final research interest lies in the study of how humans negotiate moral concerns. Here I have examined how opposing partisans tend to assume that they alone see the issues objectively and in principled fashion, a tendency we call “naive realism”. We have shown that opposing partisans attribute extremism and bias to their opponents. In studies of moral judgment, I have shown how emotions such as anger, sadness, and fear influence judgments of causality, fairness, and risk. More recently, I have begun to study the contents of three moral domains – autonomy, community, and purity – and how these domains relate to emotion and prejudice. Morality, “neuro-morality,” and positive psychology are vectors that ILI includes in its programs teaching Integrative Law. It is exciting and gratifying for us to have the support of one of the most creative scholars in the field. Mohandas Gandhi is well known and even revered for pioneering the use of non-violent passive resistance for large-scale political purposes. Less well known is his early career as a London-trained lawyer, captured in this remarkable photograph. He rejected “business as usual” adversarial litigation, in favor of looking to heal the roots of conflict in the hearts of his clients experiencing personal disputes. It was in the course of fighting as a lawyer for the civil rights of Muslim and Hindu Indians in South Africa that he was given a copy of Thoreau’s Civil Disobedience to read while in jail. Out of this grew Gandhi’s development of new techniques for mass nonviolent civil disobedience that became his life work. We at ILI are putting together a gallery of contrarian heroes of the legal profession who understood, long before mediation or ADR had names, that the highest and deepest calling of a lawyer working in the realm of personal disputes is to heal breaches in the social fabric that manifest as legal issues but gather their destructive force from fractured human relationships. We begin with Gandhi, and we invite you to send us quotations and links to your personal favorite legal heroes in the evolution of what we now call Integrative Law. We’ll add those we especially like to the ILI Gallery.